Content curation requires the aggregation of several sources within a single view that can be easily scanned. In Cronycle you can aggregate content in Feeds. 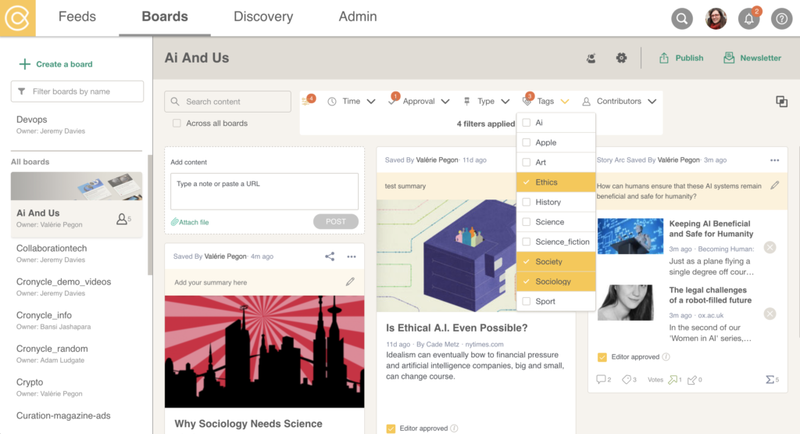 Applying filters on top of this content aggregation helps information workers organise incoming content in a particularly relevant manner. Cronycle also lets you save, organize, and publish content (check our product page if you are not familiar yet). What sources does Cronycle aggregate? 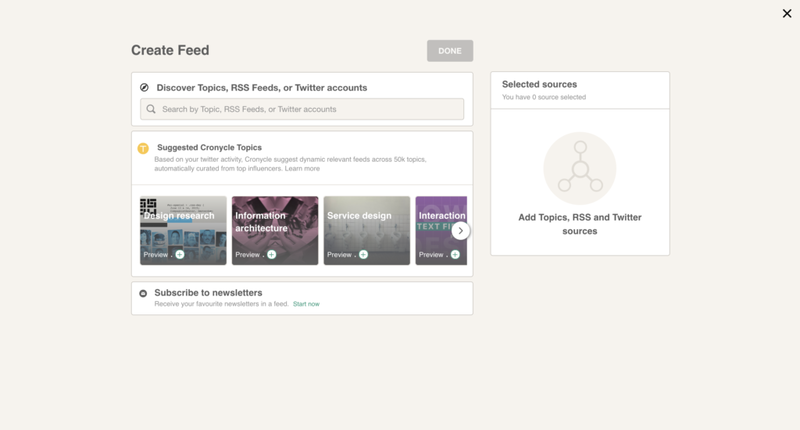 For each feed, you can collect content from different sources: RSS feeds, Google Alerts, Twitter handles (we retrieve links shared) and our own Cronycle Topics. You can also subscribe to your favourite newsletters and have them delivered in a specific feed. 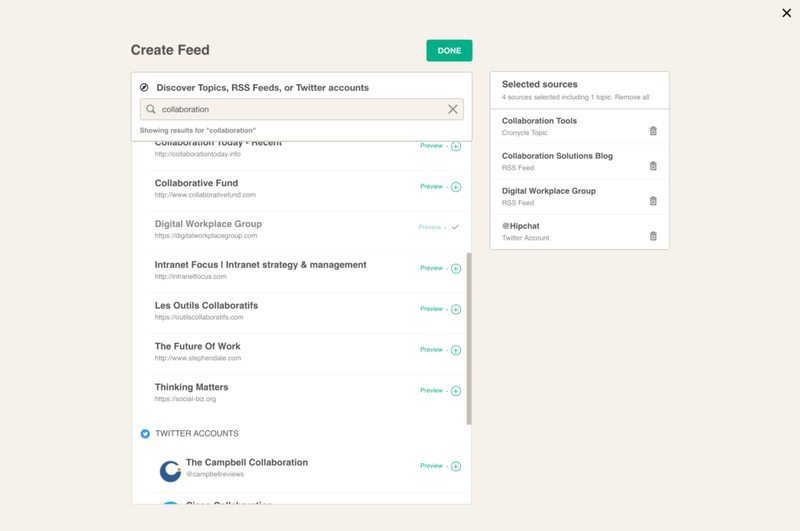 Today, we have just updated the way in which you create feeds: it is now easier to collect several sources into one feed, from the Feeds page. Simply click on Create Feed (top left) in our Webapp. (Our iOS app works in a very similar fashion too). This opens a full screen interface dedicated to creating your feed, so you can concentrate on this task. 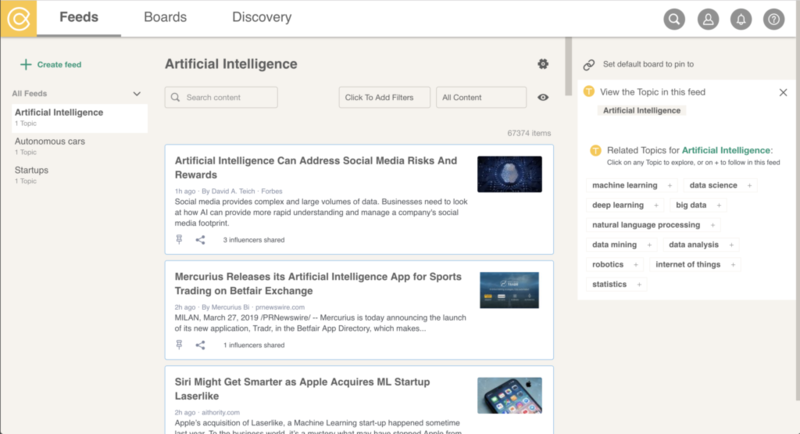 You can see suggested or trending Topics, Curated Feeds from your own organization (if you have a team in Cronycle), and the possibility to subscribe to newsletters. And at the top, you can search any subject you are interested in. Once you have a good set of sources, you can click on Done, name your feed, confirm… and see the resulting feed which aggregates the content. Note that you cannot add more than 5 Cronycle Topics (our automated feeds) per feed. 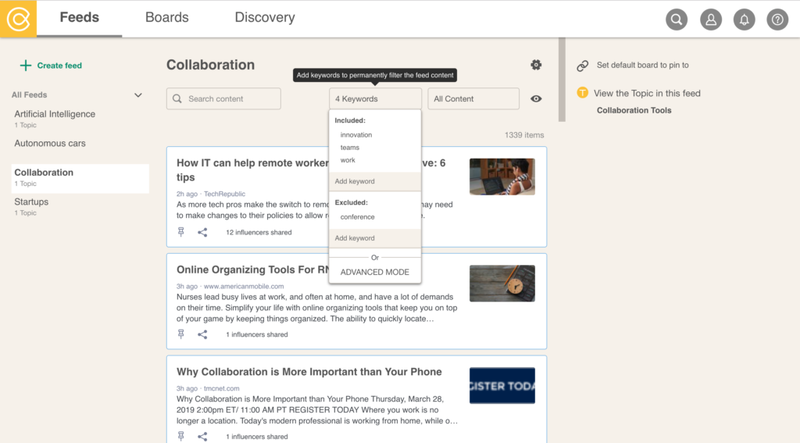 You can make your feeds aggregate content with even more focus and relevance by adding your own keywords to include or exclude, or by switching to advanced mode for boolean operations. Content pinned onto boards: worth saving, often associated to one or several large categories / boards. Content with one or several tags: relevant to specific subject(s), criteria, workflow status, or anything you can describe in a set of tag words. Editor approved content: content ready to be sent to publishing. On your boards, you can filter and search across several criteria, on a single board, or across all boards. Also, when adding tags, we display those already used on the current board to help you apply the same tags again. But now we go a step further, with Organization tags. We noticed that managing tags is difficult enough for one person, and very quickly gets out of hand in teams. 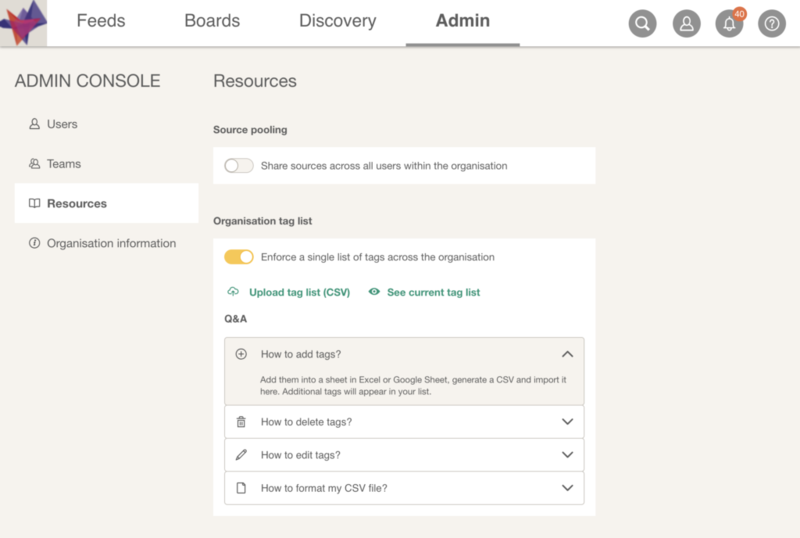 We worked with some of our customers to provide teams a way to have a controlled tag list, applied across the organisation. Admin users can upload a CSV file of their tag list. From that point onwards, users in their organisation can only apply the listed tags. To update the list, the admin can replace it any time by a new tag list. Next month, it will be also possible to edit the tags within the list, in Cronycle. Note that this feature, and the brand new Admin Console to access it, is only available for Enterprise users.